20th century mean global sea level rise | Climate Etc. On the acceleration of sea level rise, the Gilligan effect, and the garbage solution. Two out of three reconstructions of GMSL (global mean sea level) from tide gauge data extending back to 1900 or earlier indicate non-zero acceleration. Estimates range from 0.000 to 0.013 [–0.002 to 0.019] mm yr–2, so it is likely that GMSL rise has accelerated since the early 1900s. 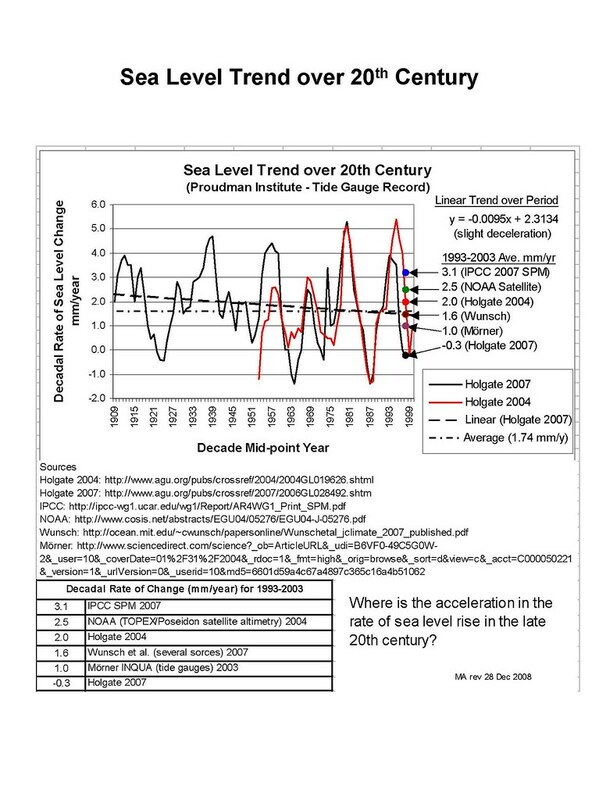 Twentieth century global mean sea level rise: is the whole greater than the sum of the parts? Abstract. Confidence in projections of global-mean sea-level rise (GMSLR) depends on an ability to account for GMSLR during the 20th century. There are contributions from ocean thermal expansion, mass loss from glaciers and ice sheets, groundwater extraction and reservoir impoundment. We have made progress towards solving the “enigma” of 20th-century GMSLR—that is, the observed GMSLR has been found to exceed the sum of estimated contributions, especially for the earlier decades. We propose that: thermal expansion simulated by climate models may previously have been underestimated owing to their not including volcanic forcing in their control state; the rate of glacier mass loss was larger than previously estimated, and was not smaller in the first than in the second half of the century; the Greenland ice-sheet could have made a positive contribution throughout the century; groundwater depletion and reservoir impoundment, which are of opposite sign, may have been approximately equal in magnitude. We show that it is possible to reconstruct the timeseries of GMSLR from the quantified contributions, apart from a constant residual term which is small enough to be explained as a long-term contribution from the Antarctic ice-sheet. The reconstructions account for the approximate constancy of the rate of GMSLR during the 20th century, which shows small or no acceleration, despite the increasing anthropogenic forcing. Semi-empirical methods for projecting GMSLR depend on the existence of a relationship between global climate change and the rate of GMSLR, but the implication of our closure of the budget is that such a relationship is weak or absent during the 20th century. The paper is an early online release for the Journal of Climate: abstract [here]. So . . . the addition of one more paper to the literature without an accelerating trend (2 out of 4) implies, according to the IPCC reasoning about uncertainty, that acceleration of sea level trend is ‘about as likely as not.’ Under this line of reasoning, the addition of one paper to the literature can change the assessment from ‘likely’ to ‘about as likely as not.’ And since the Gregory et al. paper seems to be superior from a methodological perspective, a more sophisticated assessment process would weight this paper more heavily. It looks to me like the IPCC needs to change this particular conclusion (especially the confidence level) in view of this new paper by Gregory et al. My problems with the IPCC’s characterization of and reasoning about uncertainty are described in my paper Reasoning about climate uncertainty, and this particular case is a good example of the flimsiness of many of the confidence assessments, especially for data sets that have a low maturity level. Here is something else of interest. While Chapter 3 is on the Oceans, Chapter 13 is on Sea Level Change. Chapter 3 did not mention the new Gregory et al paper, but Chapter 13 mentions the new Gregory et al. paper multiple times. In fact, Gregory is a lead author on Ch 13, and Gregory’s coauthor Church is coordinating lead author on Ch 13. The material in Ch 13 is on sea level acceleration is much better than that in Ch 3, but observed acceleration of sea level rise seems to belong to Ch 3. Hopefully, the authors of Ch 13 can motivate or provide a more sophisticated treatment of this issue in Ch 3, with a more defensible conclusion on this for the SPM. Long ago the TV series GILLIGAN’s ISLE dealt with the issue of sea level rise. The Castaways (with no heat, no light, no motorcar, not a single luxury) were all in a panic as the measuring stick they used to measure the depth of their lagoon indicated that they would soon be underwater. (The Professor calculated it quite precisely). Ultimately, they found out the Gilligan had been using the stick for something else, like catching lobsters, with a little bit getting broken off each time. The skipper chased him around the beach, whacking him with his skipper’s hat, but otherwise the Castaways remained high and dry until their eventual rescue. I think that pretty much explains the Global Warmists methodology as well. JC message to the IPCC: the moral of the Gilligan story is that you can read too much into observational data sets that are not robust and have not reached a sufficient level of maturity. JC summary: The IPCC should ask the authors of Ch 13 to take a look at the sea level rise part of Ch 3, they seem to have a much better handle on the complexity of the issue. It looks to me that the evidence for accelerating anthropogenic sea level rise is pretty weak, and lost in the noise of natural variability (see also the previous sea level rise thread). Given the low maturity of the GMSL data sets, it doesn’t make sense to use GMSL as a primary variable for documenting the existence of AGW. Rather, the practical issues associated with sea level rise are fundamentally local, and local sea level rise can be substantially different from GMSL rise. Practical solutions like land use policy and landfill seem to be a better choice than hoping to control sea level rise via reducing greenhouse emissions. As long as the mass loss from Greenland keeps accelerating, things don’t look all that rosy. Bob nice 10 year graph. Couldn’t you find a video of the Norse settlers farming Greenland in the MWP? Dont know what they would have planted to grow in all that ice. Christmas trees perhaps? Seasons greetings. You mean the one showing them growing strawberries, brocolli and tomatoes? That is in a secret vault only available on a need to view basis. You haven’t convinced me slr is something to be concerned about, but you have convinced me you possess a well developed sense of humor. Nice one. 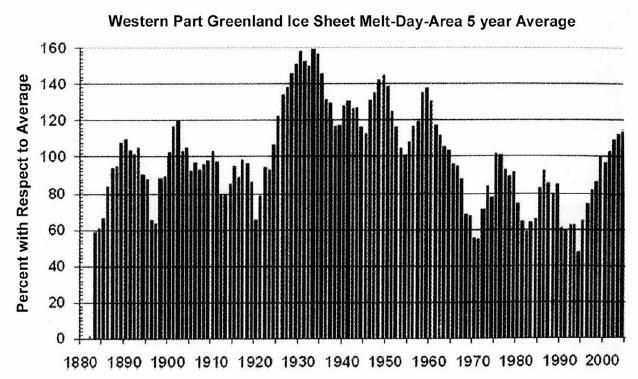 It may be a better idea to cry wolf, if we ever pass 1920-1940s melt levels. Can you update that chart so it is as currant and the one I posted? The rolling 12 month average melt rate has doubled since that bit of research! Still cyclical and exactly what you would expect close to the end of positve AMO. As if Greenland were the only input into the ocean. Right. It still reaches halfway up a duck, and amusingly, the edge of human habitation. Very likely it will in fact be ice. Unless we make it so far into the future that we’re around when the sun becomes a red giant. That would make lolwot happy at least. Kim: You sure know how to ruffle some feathers. Sea level will plateau and then drop, just like the temperature and other climate indices. Global climate may not cycle and repeat, but it sure does rhyme. temperature hasn’t plateaued, let alone dropped. C’mon lolwot, sure the temperature has “plateaued”. Two others (GISS, UAH) say it has warmed slightly. On average these indicators tell us it has not warmed since the end of 1997. No one knows what it will do for the next 15 years, although it would seem likely that the long-term warming since 1850 of around 06-0.7C per century would resume. We’ll just have to wait and see, lolwot. neither hadcrut or rss show a plateau. The large uncertainty ranges preclude you from being able to claim temperature has plateaued, let alone cooled. “neither hadcrut or rss show a plateau. Given that one shows positive and one shows negative, that the uncertainty interval easily covers zero trend for both, and further that the uncertainty is approximately 3 times the trend, “plateaued” would appear to be “most likely” by IPCC standards. Lolwot – these temperature measurements are all screwed up because they do not correctly take into account the shape of the super El Nino. In satellite data it is twice as high as the El Ninos that existed during the eighties and nineties which preceded it. It is also very narrow and sharp and on both sides of it are La Nina dips There is also an actual real plateau which I have called the twenty-first century high. It starts with 2001, not 1997, and extends to 2007. It is then followed by the 2008 La Nina that troubled Trenberth who did not understand what was going on and complained about in his email. The twenty-first century high itself is composed of two El Nino peaks with an abortive La Nina dip in between.The super El Nino brought so much warm water across that it lingered and blocked the expression of that La Nina. Now back to the super El Nino. The ground-based temperature curves they used to determine the extent of warming/cooling that I saw had such poor time resolution that the super El Nino had collapsed into a wide hump that filled both La Nina dips on its sides. Only that way can they claim that the temperature plateau begins with 1997. Like I said it begins with 2001, after the super El Nino has come and gone and the La Nina dip that followed it is over. This means the beginning of the temperature plateau was twelve years ago, not sixteen. If these people had only bothered to read my book they would have known this. Apparently the run of climate scientists simply don’t read or know about important literature in their own field. Now about the question of cooling. It is quite true that both HadCRUT and RSS show a cooling in the twenty-first century. On the other hand, UAH, GISTEMP and NCDC do not. You can’t have it both ways and an average makes no physical sense. I go with UAH and GISTEMP on this one. RSS has been monkeying with their output lately and it has been slowly pulling away from UAH. As to HadCRUT,they are up to no good. They show a rising global mean temperature in the eighties and nineties when the satellites (both UAH and RSS), GISTEMP and NCDC all show a horizontal global mean from 1979 to 1997. There were ENSO oscillations then, yes, but global mean staid the same. Unfortunately in most temperature curves this is wiped out by an imaginary “late twentieth century warming,” It is fake but is needed to support the fiction that Hansen in 1988 reported global warming to the Senate. I checked the dates and 1988 indeed was the warm peak of the 1988 El Nino. There were five El Ninos in that period of the eighties and nineties, and the 1988 El Nino is the middle one of these five. Get my book if you need to know more. and why would we expect it to? didn’t even skeptics on the other thread decide doubling CO2 caused 1.6C warming? Compared to that nature has no chance. No, using the questionable model deltaT=lamba*deltaF and considering the estimated imbalance, a few skeptics indicated that based on the GHE theory, that the likely range is lower than the mid-range of the widely publicize best estimate. Since the true impacts of longer term natural variability are not known and the one confidence estimates of aerosol and cloud forcings used to tune the models to that “range of comfort” are quite a bit more uncertain that previously considered, that it might just be time for a do over. Luckily, no one went over board with their confidence levels and pressed for global action based on slightly flawed logic. So we can soon all just laugh over a couple of drinks, about this interesting episode in science. If the latest studies are correct, a doubling of CO2 could cause 1.6C warming all other things being equal. And, as we have also seen, Nature overwhelmed unabated human CO2 emissions representing almost one-third of all human CO2 emissions ever. So don’t underestimate Nature, lolwot. That’s why they call her a “mother”. So don’t underestimate Nature, lolwot. That’s why they call her a “mother”. We have now entered the red AGW world, of the man-iac. As I thought a lot of lip service was given last thread to supporting the estimate for 1.6C/doubling of CO2 just to bash the IPCC. But when it comes down to the metal not even the promoters of the estimate believe it. Why I wonder do they expect others to. Nature has no chance of what? Getting lucky New Year’s Eve night and going home with some hot guy? Being invited on the ToNight Show? I read an interesting article from some researchers in NC who had found – locally – that there had been no sea level rise until ~1970 (don’t hold me to the date) and that the current rate was on the order of 8-10 inches/century. Quoting an acceleration since 1900 of up to 0.013 mm/yr seems methodologically unsound, and means an increase in rate of about 1.5 mm/yr over whatever it was in 1900. Awfully hard to get worked up about that (and how would you know it happened?). You can’t generalize to global sea level rise from any particular site, John. The average rise varies in different parts of the ocean and the net sea level rise depends on whether the land is rising or sinking. It is good that we continue to accumulate better and better data from satellites, ocean floats, and other instrumentation. It seems the more of higher quality data we get, the less urgent the “global warming” problem appears. The money spent on these systems is money well spent, IMO. It is also interesting that every IPCC report has produced a lower projection than the previous one – if these trends continue, we should be see IPCC predictions of an ice age approaching by the end of the century. For the IPCC both the MWP (Medieval Warm Period) and the LIA (Little Ice Age) existed before the ‘hockey stick,’ so viewing the situation objectively–after the IPCC participated in the rewriting of history by showcasing the ‘hockey stick as a part of the Left’s efforts to manufacture a supposed consensus about climate change–the IPCC condoned a fraud that federal climatists to this very day persist in perpetrating on the public. The Medium is the Message: that the public allows their children to be a part of the government-education complex that continues to engage in fraud and deceit for ideological reasons explains why the West is dying. A society that cannot be honest with the futures of its children does not deserve to survive. Waggy, I’m not sure why you complain so much. I’ve read a number of theories on why some people are chronic complainers. Complainers feel they are victims. Complainers do not feel worthy. Complainers are crying out for attention. Complainers are crying out for love. I don’t know if any of these describe you, but I sense something is wrong with your life. Complaining may give you relief, but is it really a solution? The globe stopped warming. AGW climate modelers cannot understand why and where their ‘warming’ went. However, they do know that all of their predictions were wrong and for everyone to see! That makes them feel very afraid; and, project their self-deception and hatred of America wherever they look. It makes them want to leave our world and look elsewhere in vain and deluded attempts to keep their global warming hoax alive. That is why they say, don’t look here on the Earth, look over there at Venus and at Mercury. See how hot it is there. Do you want that here? Please define “the globe”. This is not a scientific term, but rather something your first grade geography teacher might use when looking at the little model Earth on her desk. Surely, but the broadest measurement of the energy of the Earth system, it continues to warm. @Droege, how many Gigatons of ice is there on Greenland? Where do we see the effect in the graph on Lubos site? 685,000 cubic miles, a few gigatons. Where do we see that in the graph on Lubos’s? Who makes an argument based on a graph for one location when the topic is global sea level? Hansen has the mass loss doubling rate bracketed between 5 and 10 years. If the melting rate continues to stay within those two points, and given that the current contribution to sea level from the Greenland Ice Sheet is only about 0.1 mm/year, we won’t see a lot of sea level rise until later this century. But when we do, it will be significant. Maybe not you or me, but Ted Williams will. I’m healthy, I exercie, eat right and plan to live to at least 140, maybe even make the new millenium. You’re too stupid to live that long. It’s amazing you made it this far. Springer, you gots no arguments so you turn to insults. But I am smart enough to consider the intelligence of an insulter before I get offended. Carry on, someday you may make a contribution to this blog, I’m not holding my breath. The modellers have done a great job so far in forecasting the near future from 2000 to today. How could this longer-term dire prediction _possibly_ be wrong? Love the Ted Williams reference. I’m even a bit envious. Hope you make it. I know I’d love to see what the world looks like in 50 – 100 years. That’s assuming we make it through today. No Bob. You made that argument that you would live to 140 years old by living a healthy lifestyle. I made the counter-argument that you’re too stupid to live that long. You’ll eventually forget to look both ways crossing the road or something like that. Springer, you see, I did not make any argument that I would live to be 140. You should reread what I actually wrote. You are lacking in reading comprehension. There have been several such studies, which have found that the IPCC projections are cheerful and optimistic relative to the gloomy individual studies. As a consensus document, the ARs tend towards the very conservative. Of course, science deniers can’t cope with even these very gentle, watered-down reminders of the stark reality. I keep on wondering how on earth we will be able to accommodate a sealevel rise of 8 inches per century in London when our only daily experience is of a rise 250,000 times faster (14 feet in 6 hours of incoming tide) in the centre of the city. How will we ever cope – with only four human generations (two or three complete infrastructure cycles) to prepare? Lucky we don’t have to do anything urgent like staging the Olympics on time and on budget or anything really hard like that…..
“Sarcasm” with a ludicrously wrong estimate of SLR is really just a joke at your own expense. “…and lost in the noise of natural variability…” Oh my yes. Maybe it’s just an oscillation. Being a life long sailor on 4 of the 5 Great Lakes, I have paid attention to Great Lakes water levels, measurement & systematic recordings of which began @ 177 years ago. The Great Lakes’ water source is mostly snowfall in Northern Ontario Canada. 95% of water loss is through evaporation. The records for highs and lows: 1964 had the lowest water level recorded and 1986 was the highest water level recorded. If I recall correctly, the 1960’s was a time of coldness and worry for a descent into an ice age. The 1980’s was a time of accelerating and catastrophic global warming. If I have the physics right, there is more moisture in the air during hot global temperatures, and lower atmospheric moisture during times of colder global temperatures. Now for the tricky part: during times of global cooling, and maybe its the rate of change rather than absolute temperatures, the gradient for evaporation is higher per water energy content particularly in a windy environment. The Winter Alberta Clipper dries out the Great Lakes if there is no ice cover. On a hot and muggy sunny summer day, at the peak of sun’s warming effect, around 2 to 5 PM, I get becalmed. Not a puff of wind; time to paddle. More hot and muggy days should mean less evaporation and higher water levels. If I just look at Great Lakes Water Levels using the Army Corps of Engineers database Detroit District, current water levels are going down. If I look at recent global temperature data sets, global temperatures are either flat for 16 years or going down. I have traveled on several of the world’s oceans and frankly I can’t tell whether they are rising or falling. If I use a microcosm of world water, the Great Lakes, the rise and fall of world oceans may reflect what I have conjectured from observing the Great Lakes water levels on a more rapid level than might be seen in oceans. During times of warmth, the ocean water levels rise as atmospheric moisture increases but at a rate decelerating when atmospheric temperatures over oceans approach say 33 C. During times of coldness the oceans fall at an accelerating rate until the oceans become iced over. If we predict from this relationship that the current plateau or maybe even decline in global temperatures, given some ocean lag, then we should see ocean levels either plateau or falling. Now, if we can just stop climate scientists from fiddling with the raw data, adjusting what they believe should be the correct ocean behavior, we may actually be able to discern a trend, construct a hypothesis and make predictions. The Great Lakes water levels are being tracked for bulk carrier shipping and lake shore residents. I know there are some open spigots like the Illinois Canal and the outlet to Lake Huron. But those are relatively constant sources of loss summer and winter. Shhh…Let’s keep it quiet about the possible rapid response of Great Lakes water levels to global temperatures or else climate scientist will want to adjust the Great Lakes raw data to keep pace with their oceanic brethren. I remember the appropriations we got to address the extensive shoreline erosion on Lake Michigan during those high water years in the late 80s. There was a dramatic increase in water levels and our Great Lakes experts talked about a cycle of about 20 years or so but my memory fails me for exactly the number. The drop in levels has been going on for quite a few years now. If there are cycles to the water levels of the Great Lakes, they are not easily discernible. I have heard all sorts of tales of cycles etc. Looking at water levels the immediate years after the peak, 1986, water levels fell considerably. Several years ago, the US Coast Guard station at Cleveland Ohio declared that Lake Huron/Michigan were ice free when Environment Canada on their ice chart showed almost complete ice over for Lake Huron and most of Lake Michigan. I would tend to have more faith in the Army Corps of Engineers since they have to dredge the channels if water levels are too low for bulk carriers. I am not aware that ACE describes any cycles to Great Lakes water levels. And your ignorance of the basic scientific facts is relevant how? If the IPCC keeps abandoning elements of the global warming hoax like sea level rise will they be asked to return their Nobel Prize? Tamino holds fast to the GCMs, that the discrepancy between observation and the scenarios at this time is due to shorter-term natural variations not taken care of by the long-term view of the GCMs. This may be, but it at least demonstrates that the GCMs are inadequate at 24-year timeframes. Which means that the science is not settled and the outcome, not certain. Certainly not at the 95% level. Both of these points seem lost to him. Notice that he uses GISS and not HadCru4. Hi All, Just a tidbit bit of info: It would take 9137 cubic kilometers of ice melting to raise the sea level one inch. We must assume that you mean 9137 cubic km of land-based ice. Because that volume of sea ice melting would produce no rise at all. Not even 0.002 mm/year..
9137 cubic km is approximately equivalent to Canada’s entire land mass covered by 1 m of ice [9,137,000 sq km x 1m]. This means that since Greenland’s land mass is approx 410,000 sq km, and assuming that it is covered in its entirety by ice, 22m of Greenland’s [land based] ice would have to melt to produce that 1 inch [= 25.4mm]. Hi Tetris, You are correct – land ice. Sea ice is, basically irrevelant. There was a story on discover channel several years ago on the research of human bones in Greenland. It showed that in the 900-1100s, the proportion of protein was 80% land based,and 20% seafood. In the 1200-1350s, the percentiges were reversed. The study was done by Danish scientists, but I don’t know who they were. This implies a quick cooling due to an unknown mechanism. The unknown mechanism is snow caused by warm oceans and open Arctic. Watch for it, it is coming again. Ever notice how when UAH data needs to be adjusted that the need is a direct reflection on Dr. Spencer’s competence. But when the JASON or GRACE data needs to be adjusted it is merely science in action? Joseph D’Aleo says, We live in the “Misinformation Age”. As this thread and the previous one on the new ECS estimates are showing, we are “winning the war against global warming”. We are doing this NOT with CO2 abatement actions or carbon tax schemes. We are doing it with DATA. but you don’t accept the ocean heat content data which the new ECS estimates are based on. Don’t you understand? It’s the Kyoto Treaty. 16 years of Kyoto Treaty results in 16 years of temperature flat lining: an absolutely incontestable positive correlation, and at that level of correlation one might reasonably surmise causation… And I didn’t even have to splice the Tornetrask data series into my graph upside down to get that result. I have concluded (as have others) that the OHC data prior to ARGO are spotty and very doubtful. Even if we accept these, the new 2xCO2 ECS is estimated to be 1.6-1.7C. If we assume there was less warming of the ocean than the record shows, then the ECS estimate would be slightly lower. How likely is it that the warming shown prior to 2003 is exaggerated? Just prior to ARGO, expendable XBT devices were used, which introduced a “warming bias”. Since ARGO started in 2003 we first saw slight cooling, then the ARGO data were corrected and we now see slight warming. The rate of warming since 2003 is slower than the recorded rate of warming prior to 2003. So it is likely that the OHC record prior to 2003 gives slightly exaggerated warming. Since we are talking about temperature changes of thousandths of a degree, it’s all pretty nebulous. But even if we accept the OHC record, the 2xCO2 ECS is now only 1.6-1.7C. Hope this clears it up for you, lolwot. Britain has been tilting to the south and east for several thousand years: The further west you go, the more land you will see that used to be submerged. For instance, in the west of Wales, Harlech castle, which used to be a stronghold, due to being surrounded by the sea on 3 sides, is now surrounded by green fields. Parkgate, which used to be a resort, still has a promenade, but no beach or sea, just a view of green vegetation growing on marshy ground. Chester racecourse used to be a harbour in Roman times. On the other hand, East Anglia is sinking. This could be a cause of irrational thinking by people living and working there,or even teaching at the university. People in this region may believe that the sea level is rising rapidly, when the reality is that their part of the country is actually sinking. Such people may believe that this “sea level rise” is due to climate change. This is analagous to how primitive peoples used to attribute supernatural forces to natural phenomena which they didn’t understand. This not surprising conclusion gives the lie to the IPCC belief that climate change began in 1961, ignoring the 0.5C chamge 1910 and 1940. But it did provide the rationale for the IPCC to not explain the equally sharp drop in temoerature after 1940. Only quantum thermodynamics can explain that. there’s no such belief that climate change began in 1961. However the human driver of climate has grown since 1900 so 1961 or so is about the time it starts to dominate over natural variations. A cursory glance at world average annual climate clearly shows that the climate was much closer to normal (unaffected by man) in 1910 than it was in 1940 or 1961. Between 1910 and 1940 temperature shows a steady upward climb of about 0.15C per decade that only CO2 could explain, yet the IPCC persisted in calling the 1961 temperature normal. Why? The 1940 temperature was a permanent addition to the world’s heat and has been slowly percolating through the oceans ever since. lolwot, thanks for replying. ” Between 1910 and 1940 temperature shows a steady upward climb of about 0.15C per decade that only CO2 could explain….” Dead wrong. The warming began suddenly after a good ten years of cooling. There was no parallel surge of atmospheric carbon dioxide and that makes greenhouse warming by CO2 impossible. Worse yet – in 1940 that warming came to a complete halt with the arrival of World War II cooling. You cannot turn off greenhouse warming without also turning off your your greenhouse gas supply. And don’t give me that fable of aerosols from WW II war factories. As the cooling began carbon dioxide just kept going up while the Finnish Winter War of 1939/40 was fought at minus forty Celsius. The severe cooling lasted through the war but some idiots compiling temperature curves decided to show the war years as a heat wave. As to the cause of the warming, it is very likely of solar origin, another phase of coming out of the Little Ice Age. Thanks for the reply, but I beg to differ. Before 1908 there was no motor vehicle industry. Between 1908 and 1927 Henry Ford alone made 15 eemillion model T Fords. Before 1908 there was no electrical power, by 1940 every town in the world of any size had electric power generated by fossil fuel. Probobly the greatest percentage increase in fossil fuel consumpition in history occured between 1910 and 1940. What world war 2 cooling? In 1940 nothing unusual happened in the natural world and WW2 was in it’s phoney phase when factories were being built everywhere to turn out guns, planes and tanks. So fossil fuel consumption increased and petrol was rationed. Only quantum thermodynamics can explain the dramatic fall in temperature after 1940. Secret nazi climate experiments! nuff said. Wow, every single sentence has a distinct factual mistake. That’s some consistency there. record of ‘ the weather.’ Location, location. Is it even possible that man can cause global warming? It is not possible in e.g., the White Mountains of California where there has been no global warming for 100 years. Nor is it possible in the snow-covered counryside of France where there has been no global warming over the last 70 years. However, standing on the swept tarmac in jet exhaust at a French airport with an official thermometer in your hand is a different story. Only to someone who believes humanity is destroying the Earth does it seem possible that Western schoolteachers are trying to save the world from modernity. Yes, Waggy, it is possible and very likely been occurring for many decades now. The preachers of an AGW Doomsday scenarios have their apocalyptic faith-based beliefs. Hysterical religious beliefs aside, the simple fact is that climate is always changing. The geophysical record of the Earth tells the story of warm periods and huge dinosaurs that once flourished and then perished and ice ages and long periods when mile-deep glaciers covered the lands. Didn’t you read the last thread wagathon? Apparently it was determined that climate sensitivity is 1.6-1.7C per doubling of CO2. Which if true means the human CO2 forcing caused 70% of the 20th century warming. Unfortunately, too much government is not the only problem. The most unfortunate thing possible for any society is when institutions founded on truth begin to prefer fiction. It is a simple fact that gravity pulls the apple to Earth, yet it took a few geniuses to describe it in scientific terms. Do you see how very silly this statement is? Global warming would of course mean– averaged over the whole globe. How could we ever see “global” warming in your snow-covered countryside of France, unless somehow you’ve proven that France is a perfect proxy for the temperature of the whole globe? Amazing! If, say, 50% of the warming in the last 50 to 100 years has been natural, then this profoundly impacts our projections of human-caused warming in the future, slashing them by about 50%. The claim that the Medieval Warm Period or Little Ice Age were only regional in extent is countered with considerable published evidence to the contrary. Besides…why is it that the pundits who claim these historic events were only regional in extent are the same people who place global significance on a U.S. drought or a heat wave in France? Hmmm? This is not even logically correct. The percentage of human caused warming is obviously a moving dynamic that was at some point in the past 0%, then 1%, then 10%, then 25%, etc. The fact seems to be that it is increasing over time, causing more of the warming in the last 20 years of the 20th century then it did in the first 20 years. Thus, it does not become “locked” at 50% in causing future warming, but, could well account for 100% in the future (especially if we continue to warm as Anthropogenic GHG’s continue to accumulate, whereas we might have naturally cooled based on natural forcings). Roy Spencer’s statement that projections of human-caused warming in the future could be slashed by 50% is not logical or based on the trends we’ve seen. When you discover that at least 50% of everything you thought you knew was incorrect we can be 100% certain that you will be more skeptical about anything you thought might every happen. While a global temperature metric for the near-surface tropospheric temperatures is awkward in that it does not account for changes in local climates, it is useful from the most important and broad perspective…as one more metric to indicate total energy flow in and out of the Earth system. As it is, I don’t care much for the overly large focus on near-surface tropospheric temperatures, as most of our weather and climate is going to be based on ocean dynamics and ocean heat content. Near surface tropospheric temperatures are such a small fraction of Earth’s non-tectonic energy reservoir, and the thermal inertia of this region is so small compared to the ocean, that it’s like trying to see how much extra weight and inertia a flee or does not add to a dog. A global average temperature is a meaningful as an average of all the telephone numbers in NYC. Did you get your NSM* early for Christmas this year? It seems to be running perfectly and you seem to have gotten the deluxe model. Congrats! The reality of course is that average global near-surface temperatures can give us a useful metric for the accumulation of energy in the lower troposphere on a global basis in that temperature is a good measurement of average kinetic energy. Thus, as more energy accumulates in the lower-troposphere averaged over the whole planet, we would expect the temperatures of the near-surface troposphere to increase. In looking at this of course, we must take into account that overall the thermal inertia and overall energy storage capacity of the troposphere is dwarfed by the oceans and far more variable than the oceans, so looking at the energy of the troposphere and comparing it to Earth’s overall reservoir of non-tectonic energy is much like weighing the flee on a dog’s back to see how much it adds to the weight of the dog. Awkward? But all of us live in a ‘local’ climate not in some fanciful and artificial global climate. Do you not think that looking at the total energy of the Earth system is a useful thing to look at? Anthropogenic GHG warming is about the Earth’s energy balance, and thus, looking at an average global near-surface temperature, or the total ocean heat content can tell us something useful about that energy balance. Granted, ocean heat content can tell us a great deal more. Also, I’ve no doubt there were tremendous storms in the past, especially during times of climate shifts as cold climate patterns clash with warm climate patterns. Based on simple physics, increasing GHG’s allow more energy to be available for storms, both in the atmosphere and in oceans. [A1] The Bayesian prior of the theoretical explanation “James Hansen’s mechanism of AGW is correct” is assigned zero weight, such that all future predictions are wholly data-driven. [A2] “Practical issues” associated to sea level rise are strictly short-term (perhaps by an implicit redefinition of the word “practical”? ); thus there is no practical need to consider these implations beyond the 21st century. [A3] “Practical solutions” are restricted (perhaps by an implicit redefinition of the word “solutions”?) to local short-term solutions. Supposing that Judith Curry were to embrace assumptions [A1]-[A3] explicitly instead of implicitly, perhaps collegial appreciation in regard to the (now-explicitly) restricted relevance of her conclusions would be enhanced? In any event, the soon-to-come tranche of JASON-2 sea-level data surely will attract much interest! Wrong. C3 is not dependent on A1-A3. In fact we know there is nothing we can do on the mitigation side to stop the rise, given the inertia of the system. This is now an engineering problem. Steven is correct in that there is very little we can do to stop the inertia of the system over any short to medium periods of time. Adaptation is the best primary strategy for decadal to century lengths of time. Once the great ice masses of Greenland and parts of Antarctica start to melt (as they have) we need to look at the “long game”, which is adapt first, and mitigate as possible second. Underlying this entire context is the fact that we have not yet seen the equilibrium response or Earth system response from 350 to 400 ppm of CO2– since the oceans are warming and ice is melting and the seas rising. More important for the “long game” is that greenhouse gases continue to rise, which means that even if we somehow stop at 450 ppm of CO2 (which seems unlikely), we must expect many centuries of adaptation ahead. Wrong. By the time rising sea levels will hypothetically be a significant problem (based on linear extrapolation), the onset of the next ice age will start to reverse the sea level rise with a vengeance. But if Dr. “tipping point” Hansen is correct in his reading of the entrails, our profligate CO2 production might delay or halt the slide into the next ice age. One can only hope! But does anybody really believe there is enough fossil fuels available to deter the next ice age? When the sea level stops rising, that is the time to really worry. I frequently read about the “system inertia” which is delaying the acceleration in sea level rise, but I have not been able to find any creditable information that quantifies the amount of the hypothesized delay. In your opinion when will the rate of sea level rise accelerate? Rob Starkey, the sea-level rise is already twice the century average. What would you define as an acceleration if that isn’t? We have 1 set of pretty reliable data from the early 1990’s to present that shows no acceleration. The data estimates prior to that time (for several decades at least) show that the rate of rise was pretty consistant (within the margin of error) with the current rate of rise. The current rate of rise will result in about a foot of rise between 2000 and 2100. In order for sea level to rise by over two feet by 2100 or by the 6 feet that some have said is probable, the rate of rise will have to accelerate dramatically from what is being observed. My question is very simple- when will the current rate accelerate or if it does not accelerate by a certain time can it be agreed that the concern was overstated? What is the estimate of the rise rate since 1900? It is about half the current rate. The estimate for the last few thousand years is also much less than half the current rate. I would say it has already accelerated, but notice has not yet been taken. You seem to be trying to respond while at the same time being unresponsive in your reply. I believe you know that the data to determine the rate of rise from 1900 to 1992 is very unreliable, but that is not actually relevant to the central question. The question is when will the “inertia” be overcome that will result in the acceleration in rate of rise that will be necessary to achieve the 2 to 6 feet of sea level rise predicted? Clearly the current rate of rise will need to increase dramatically (by more than 100% to over 600% higher than the current rate) for these feared outcomes to occur. Again I ask- By when will the rate of rise accelerate? The warming rate coming out of the last ice age was about a degree per millennium and sea level rose about 2m per century. We now have a faster warming rate and still 1/3 of the Ice Age glacial mass left to melt. Some estimates can be based on this, but it depends on the resilience of the ice sheets. With respect, oh Skeptical Warmist, what in your view is the most rationally skeptical “Plan B” in the scientifically plausible eventuality that the “long game” of climate change proves to be lethal? It is obvious to me now that the nations of the world will fail to prevent a 2C rise in temperatures, and very likely fail to prevent a 3C rise in temperatures. Adaptation (which is what humans have always done in the face of a constantly changing climate) seems a necessary immediate course of action. But though we’ve failed to bring forth meaningful policies that will prevent future warming, I do believe that eventually we will, and we might, if we are lucky, prevent a rise in global temperatures beyond 3C. This prevention of going over 3C would include a combination of GHG reductions brought about by energy policy and possibly some geoengineering techniques (maybe even artificial photosynthesis which uses up CO2 and produces useful energy).. Unfortunately, I don’t see any this beginning to happen for a decade at least. Until then, the increasing frequency of disruptive weather events will make adaptation have a more immediate financial and existential payback. If it proves to be lethal, then it would seem that we won’t need a “Plan B”. Game over. Eventually something will take us out as a species— but it would be nice if it wasn’t our own stupidity. It was obvious to me that from the beginning, nations of the world would prevent any rise in global temperature. Because there wasn’t at any time any serious discussion about it. The ocean provide a vast area of sunlight, and anything which modestly increase the amount photosynthesis of ocean life, could have dramatic effects in terms affecting entire world. One could probably dismiss any possible project which involves land surfaces. There is locations in Space in which gravitation forces of the Sun and Earth are balanced. These are called, Lagrangian points. Or Earth/Sun L-1. Which btw has at least satellite looking at the Sun- all those pretty and weird pictures of sun come from the this satellite. Anyhow, things in L-1 basically stay in L-1. And L-1 is a vast region- one put several earth size things in this volume of space. If you did, it would block sunlight from reach Earth. L-1 is always, between the Sun and Earth and it’s beyond the Moon’s orbit [about 1.5 million km from Earth]. It’s possible to put a vast solar shade in this location which would block all sunlight. That would be huge and even if lightweight, massive. So the fine particles put high in the atmosphere of earth from a large volcanic eruption, cool the earth. And one less dust as compared to volcanic eruption at Earth/Sun L-1 to get more cooling on Earth in comparison. Or volcanic eruption causes thin shell of dust to surround earth- you put same size of shell in L-1, sunlight needs to pass thru it twice before reaching Earth, instead passing thru it once. And slight filled spherical shell so it’s a sphere of dust more sunlight would be blocked. this area. Or amount settling on spacecraft parked this area, would also be insignificant say within periods of decade or two. There would “natural dust” in this area, right now, only question is how much, rather than a question if there is any. Whatever we might put in the Lagrangian points to reduce incoming solar needs to be reversible. The planet is in an ice age after all. Given the modest warming of the 20th century, these ideas are just odd. Yes, it be would be hard to reverse. But I don’t expect we will get 2 C of global warming. possible in 1772. So not a new concept. to exactly do this in far more detail. And no doubt, required years to develop it before launching it. possible to turn into Venus. if he bother to ask them. whether it would be good option. would be more clear that that would worth considering. The sea level rise is not due to human emission of CO2. It is due to the warming phase of the climate. Sea level took a big dip in 2011. True, and just as quickly recovered. My only point was anthropogenic CO2 did not drop; it went up. Need to take the long-view JCH. The only way to see the reality of the long-term effects of the slow rise in GHG’s over the centuries is to take the long-view. GHG forcing does not take away natural variability, but it does set a long-term trend. If sea levels (and ocean heat content) began to fall over a 20 or 30 year period– that would be significant and would completely test the notion of Anthropogenic GHG warming of the planet. But so far, nothing has. If the reason that sea level was falling was because the oceans were cooling you might be correct over longer time frames. But the oceans won’t be falling (except for the brief La Nina events) over the long-term. Quite the opposite. CO2 levels will be going higher along with sea levels for some time..
For all Left vs. right issues we know we are dealing with politics not science. But with AGW theory we also have an economic issue: just as we have the legal tax on the economy as a result of more and more regulation — with AGW theory – we have the bureaucrat tax. These are government taxes that represent a diversion of resources into unproductive activities that lead to a decrease in the overall wealth: the government essentially pays people not to work. Looking at the graphs Tamino puts up to discredit the WT article regarding bodies on a pier, which they are quite effective at doing, I must say that none of them indicate any AGW effect. That is to say I don’t see any acceleration at all, in fact some of them show deceleration but that could just be isostatic rebound as others observed. Some of the comments over there keep on referring to the indisputable evidence for global warming all around us but to be honest I can’t see it at all. Maybe I just live in the wrong part of the world but everything here, the sea, the rain, the sun, the wind, the clouds, and the flora and fauna look like they always have for decades. What is it that I am not seeing? You are apparently not very observant. Much anecdotal and circumstantial evidence exists for creeping climate change and especially warming. Fauna is a significant observation, as critters such as possum are seen further north than before. Also hard to discredit the powerful observations of freshwater lake ice-out dates over the years. People observed this trend of earlier ice-out dates by comparing to their own recollections, and all one has to do is look at the aggregated data which has been collected over the years. Somebody like Anthony Watts will never look at this kind of data because it blows holes in his urban heat island fantasy world. Obviously my point, rather like climate change, was too subtle for you to grasp. If the climate is in fact changing it is not having an effect on the weather in which I spend my days and nights. Likewise I am not seeing at any sensible level, changes to my habitat. I live in a rural, coastal setting and I spend most of my days outside. The gear I wear and the stuff I see has not changed in any way outside of what has been pretty much the norm for a long time now. So being the very observant chap that I am I can state quite categorically that there have been no unnatural changes in my area of activity. All of the changes seem to be within expected historical ranges. Sand, bush, water, bugs birds and animals look pretty much as they always have even though it all varies day to day and year to year. Pointing out stuff that is happening elsewhere, places I don’t live in, doesn’t tell me much to be frank. These places always seem to be far away and outside of the normal areas of activity for most of us. Perhaps the people who live there would have a view and their take would be very interesting. In the mean time the Global aspect of your concerns doesn’t seem to extend itself to my bit of the biosphere. Your obvious fear of Anthony Watts is clouding your thinking. He is just a guy like all of us, trying to find out what is going on and why. You seem convinced of the CAGW story. He isn’t and I have yet to see anything at all that signals a catastrophic change let alone one brought on by us burning stuff and that is really what all the fuss is about isn’t it? Catastrophic Man Made Climate Change. Yet here we are with nothing unprecedented happening. Go figure. To posit that “this time” it’s US – i.e. WE are the ones causing the climate to change, requires that one first identify and eliminate one-by-one the things that caused climate to change in earlier times. Science proceeds by building on a foundation. You can add to that foundation or try to disturb the foundation by pointing out inconsistencies. I have spent more than my share of time analyzing paleo data such as Vostok because it is so dang interesting. Whether I have made progress or not, it certainly has paid off in other ways. Do you share J Curry’s assessment as stated here? Possums further north? I recall being told by a farmer that the increasing number of possums in Minnesota was mostly casued by a hay shortage in the late eighties. during that time hay was transported from the south and the possums hitched a ride. Not sure if its true or how it compares to other factors like warming, but human transport may be a significant factor. I am very pleased to inform you that -at the last minute- you have won this years ‘Bare faced cheek’ award. In particular this phrase was judged outstanding as the barest faced cheekiness imaginable. We understand that you berated our nominator at some length following the article for utilising anecdotal and circumstantial evidence, even though such data -for example allegorical paintings by Breughel- are frequently used by scientists such as Phil Jones and Professor Brian Fagan to usefully illustrate the deterioration in the climate in the 16th century. “Like I said, all this is anecdotal information and anyone can bring forward counter information, equally anecdotal, to either negate or make the findings totally ambiguous. What’s to explain? The painting was commentary on the abnormal winters not on good places for cross-country skiing. No, actually the painting was just a painting, and you all have hyperactive imaginations. Remember the saying: “Sometimes a cigar is just a cigar”. We hope that the resident ‘Thought for the day’ franchise holder at Climate Etc-Beth Cooper- will feel moved to create a poem to mark this happy occasion. We are delighted to inform you that you have also been nominated for the equally prestigious; “Its ok if I use this sort of stuff to make my point but not if YOU use it” award . We must warn you however not to raise your hopes of scooping this additional award as there is strong competition from other posters at Climate Etc. I would concur the Mr WEB is an award winner. I called it anecdotal. That’s why I used the word, anecdote. Lot like the crap that you sell, pushing Charles Dickens because he happened to have a cold winter during his childhood. So why exactly aren’t you looking at ice-out dates over the years? There is no subjectivity to the observations, it has a built-in filter, and it provides good spatial statistics. Are you that afraid to look at ice-out dates because you don’t like what it will tell you? Btw, possums ate stupid little critters that have a life expectancy of a few years. If they can survive a Minnesota winter and reproduce in numbers, the naturalist field guides will need to change. 1. You don’t know this. 2. Climate is always changing and always having an effect on the weather. 3. The thing that is pertinent is whether humans are altering the climate, how and how much our activities will alter it, and what we might do about it or adapt to it. Congratulations! Just read the good news on your well deserved ‘bare faced cheek’ award given by the completely independent nominations committee. With your comments you are demonstrating your prejudices and that you do not read what is in front of you.You ask Why I don’t use ice out dates? Like the ones I provided for Tallinn or the fifteen glacier studies?. Or in my article ‘historic variations in arctic sea ice’ the ice dates for the Baltic, arctic and Canada from the Hudson bay company? There was Little anecdotal information in the article about Charles dickens as each year of his life was juxtaposed to actual instrumental temperature readings. So you can use anecdotes but when I do and back them up with scientific data that’s not ok? Is that because it’s not following the hypothesis you want proven which seems to be tha this era of warming is unique? You have Canadian province data to consider, the northern tier of the USA, Scandinavian countries and likely elsewhere. You mentioned Tallinn which is located in Estonia. Trends range from 2.8 to 6.3 days earlier ice-out dates every 10 years over the last 30 years. This is very comparable to the data for lake ice-out dates in Minnesota. I followed your link to your Minnesota ice information. I think the event was featured on the tv here recently. Nice work, but where do I make the claims you say I make in my ‘ramblings’ ? Such material as Brueghel (one reference out of 300) is very amply backed up by numerous studies of such things as glacier information which I quoted at length. Your assertion is incorrect. Why do you make it? Your minnesota ice information ( there is much similar stuff such as cherry blossom dates or grape harvest which i will also quote at various times) merely confirms that the title of the article ‘the long slow thaw’ is correct. I believe,like you, that the earth is generally warming but that prior to it warming it cooled and prior to that it warmed etc without any help from man. The ice out dates for Icelandic waters during the 10th century onwards are especially interesting demonstrating the evolution of the mwp by the same criteria of dates as you use. It then shows the cooling through the lia and the subsequent warming into the modern era. So exactly like your Minnesota information but it just goes back much further. The period of greatest change from cold to warm is approx 1690 to 1740, not the modern era. So why is my stuff of a very similar nature To yours merely anecdotal and ramblings, but YOUR stuff that is ‘anecdotal and circumstantial’ is ok when it demonstrates warming? You must realise you are applying double standards to support your viewpoint. Just smile and admit it. Thanks for the additional Material on Baltic rivers some of which I think i Have used at some time. If you have anything similar on the arctic for the period 1920 to 1945 I would be glad to see it as I’m currently finalising my article on arctic conditions during that period. Data on ice break-up, freezing date and ice duration in Finnish lakes and rivers can be found from this report. The report is in Finnish, but the Figures on p. 76-81 have captions in English as well. The longest time series from Torne river (on the border between Sweden and Finland) covers over 300 years starting 1693. Most of the time series show a rather uniform trend over the whole period of data which starts in many cases 1886 or earlier. Many of the shorter time series have no clear trend. What can I say but if you want to do objective science, don’t do it like climatereason. Sometimes you have to point out the failures for the light to come on. Climate Etc is essentially a parade of failures in skeptical reasoning. Yours just happens to be the best example of subjective cherry-picked data analysis. You are again making an airy assertion without Yet demonstrating it is true for any of my detailed and highly referenced articles. Possum migration is an example of anecdotal evidence, just as I presented. I have seen a few in my backyard for the first time ever, but that is irrelevant. Objective statistical evidence of physical measures are by definition not anecdotal. Ice-out data is very powerful. I don’t pay much attention to climatereason since he presented evidence in the form of medieval paintings portraying winter scenes. Serious scientists skip that kind of junk because they can find better use for their time. So serious scientists don’t use such material as breughel paintings? That is complete nonsense. Are you really unaware of this information and the manner it is woven into narratives by ‘serious scientists’? Your prejudice is overcoming your rationality. I suggest you read some of the academic studies conducted on the medieval ice scenes and you will see why they are referenced. I put dates of paintings into my analytical expressions and calibrated the parameters according to the cultural status of the masters involved. Oh my gawd, what a pretentious twit. That is what you sound like. WWFS (What would Feynman say) ? Ha ha. Keith, your local Audubon Society is always on the lookout for observant chaps! Audubon Christmas Bird Count Results We were able to look at the winter distribution of 305 species to see if their winter range had shifted over the last 40 years. We discovered that 177 of these species showed a significant shift north and this northward shift was correlated with an increase in mean January temperatures in the contiguous 48 states of almost 5 degrees during that time. Climate Etc. folks, there’s still time for you to join this year’s Christmas Bird Count! So contrary to Keith AB’s unsupported claims, the effects of climate change on wildlife are becoming plainly visible to ordinary citizens, in pretty much every nation of the world! (my spouse is a certified Audubon Master Birder,and assures me that every serious birder sees climate-change plainly). Keith AB, why not get yourself some binoculars, and a notebook, and open your eyes, eh? You do realise that prof Brian fagan is a well known warmist so he is YOUR pretentious twit? So jean grove and Hubert Lamb are also pretentious twits for referencing historic material? That puts me in very good company, thank you. None of which gets away from the original basis of this discussion which is that on your own admittance it is ok for you to cite anecdotal and circumstantial evidence to demonstrate warming but not for other people to cite it to try to present a more balanced picture. Yet you still can’t see the double standards you are employing. That average warming is 5 degrees F not C, in case someone thinks the number is too large. I don’t cite qualitative and subjective data, which is not my style. I work with quantitative and objective data as a rule. Why do you get so upset when I point out who uses qualitative and subjective data? I almost sense that since skeptics have nothing else to latch on to, that their last best hope is to craft narratives around anecdotal information. By the way where is your arch nemesis recently? As a member of the nominating committee, I would fully agree with the nomination of WHT for this prestigious award, as recommended by yourself and Beth. Ice-out records have a combination of qualitative knowledge and calibrated precision. The qualitative knowledge lies in the fact that it takes only one observer who knows how to read a calendar and record the date. The precision lies in the fact that the ice-out date is unambiguous, unlike other historical knowledge. This in fact turns it into a quantitative proxy for otherwise uncalibrated or otherwise imprecise historical temperature records. Since ice-out is also a natural integral averaging technique, the dates have a built-in filter associated with it and the measure is less susceptible to single-day extremes; in other words, real ice-out conditions require a number of warm days. If the ice-out date is a couple of weeks earlier in the spring, and the complementary ice-in conditions is a couple of weeks later in the fall, one can understand that winter is becoming warmer and believe that warm weather animals are taking advantage of this and expanding their ecological range. 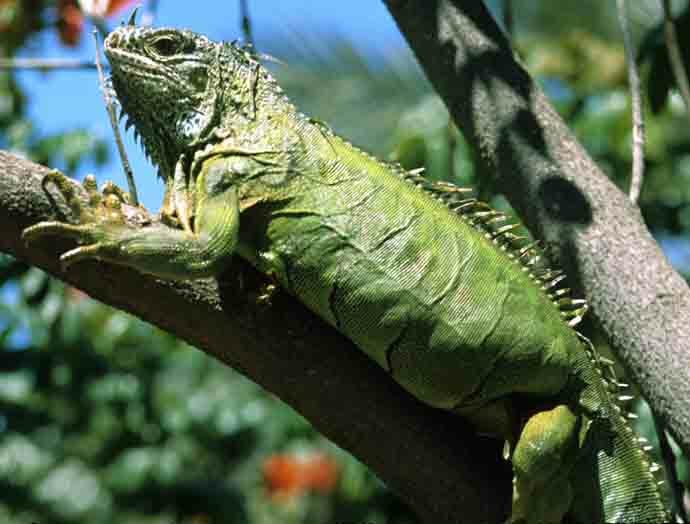 Groups like the Audobon Society are well-equipped to try to create proxies out of species relocation. They certainly have the data thanks to a number of dedicated observers. You are right. There are a lot of ice-in/ice-out records for MN and WI. Since 1964 the days per year the lake was frozen averaged 91 days. Lowest (2001) was 56 days; highest (1977) was 121 days; most recent high (2010) was 118 days. So there does not appear to be a real apparent recent trend here. Don’t know if this all means anything, though. Data from one lake. Thanks a lot Max. I can add that to the database and then find another lake and add that one. Then we can add another and another. See how that works? it is called statistical analysis and it leverages the law of large numbers and the central limit theorem until discernible trends can be detected. Sorry to be pedantic but you forced my hand. I find you unworthy of the award. However, I propose awarding Max an Unprecedented Unmitigated Audacity award for continuing to present data without uncertainties and a complete failure to acknowledge that he is statistically incompetent. Waggy gets the tin foil hat brigade award. And I can not decide who should win the MSU award for their analysis of the Venus atmosphere, either Springer or Cotton, I can not make up my mind. MSU being an acronym for making stuff up. manacker, Web, the frequency of less than 90 days frozen for that lake went up remarkably in the last couple of decades. Interesting. Wonder why? Agree Keith. Ironically, the 20th century will end up being climatically very stable, compared to the earlier centuries (when all is settled down). Yes, the 90s were somewhat warmer than the 70s and 80s, milder winters and pretty hot summers (where I live). Now the winters are getting colder again, since approx. 10 years. “Practical solutions like land use policy and landfill seem to be a better choice than hoping to control sea level rise via reducing greenhouse emissions.” Just so, Dr Curry, thank you. It might be worth emphasising that whether or not there has been an acceleration of sea level rise during recent decades, mean sea level rise as such is a long term fixture which is unstoppable by any human agency and to which adaptation will perforce be necessary. The “weird dream sequences” were actually computer enhanced virtual reality creations (like those featured in IPCC reports and low-budget “end-of-the-world” flics). Ah reckon it shore does beat all whut yew kin do with them corn-pewter “sim-yew-lay-shuns” these days, don’t it? Ah seen one in a pitcher-show by a good ol’ Tennessee boy thet showed Noo-Yawk-City gettin’ swallowed up by ‘nuther Noah’s flood (lahk in th’ “Good Book”). What is the consequence of sea level rise? Therefore, sea level rise is trivial (0.006% to to 0.03% of GDP). Furthermore, carbon tax and renewable energy would make no significant difference to sea level rise. Before concentrating on the “consequences of sea level rise” (i.e. costs), let’s look at SL rise, itself. The biggest problem in comparing long-term SL records has been that the tide gauge method of measurement was replaced with satellite altimetry around 1993. Tide gauges measure the SL at various shore locations throughout the world (where SL has an impact on us land-dwelling creatures). So the scope of measurement for the two methods is entirely different. However, every few years we learn about mishaps or drifts in the altimeter instruments, errors in the data processing or instabilities in the ancillary data that result in rates of change that easily exceed the formal error estimate, if not the rate estimate itself. In all these cases the intercomparision with external sources, mainly contemporary altimeter satellites, like ERS-1 and ERS-2, were pivotal to the uncovering and correction of the problems. With the missions of Jason-1 and Envisat now on the way for a few years, more differences between the missions pop-up. Neither of these missions currently fit the established rates. It seems that the more missions are added to the melting pot, the more uncertain the altimetric sea level change results become. As can be seen, there are considerable fluctuations in the rate of SL rise: the decadal average rate fluctuates from -1 mm/year to +5 mm/year, with a 20thC average of +1.74 mm/year. Several independent studies have arrived at similar rates of SL rise for the period 1993-2003. Holgate 2007 also shows that the first half of the 20thC had a slightly higher rate of SL rise (+2.03 mm/year) than the second half (+1.45 mm/year), and there clearly has been no acceleration in the rate of SL rise over the 20thC. Useful estimation of the global averages is extremely difficult given the realities of space–time sampling and model approximations. Systematic errors are likely to dominate most estimates of global average change: published values and error bars should be used very cautiously. Thanks for that information. However, your opening comment suggests my purpose in highlighting the damage costs of sea level rise are trivial may not have been overlooked. The reason I highlighted the damage cost estimates and that they are trivial in context of global GDP over the 21st century, is to point out that we are wasting an enormous amount of time, effort and money researching something that is not important. It is trivial. As I pointed out in earlier comments, it’s time to move on. We can cut GHG emissions – and improve the global economy, and provide electrification faster for everyone, and cut black carbon emissions, and reduce fatalities from toxic pollution – all with one robust policy. I’d suggest we should focus on that instead of wasting more time, effort and money researching trivia. Sea level rise is the least worrisome of the negative consequences of a warming planet. Disruptions to the food supply (Including the ocean food chain) and access to clean water would be the more significant. What’s the cost of a few tens of millions of starving people? Trivial? There is absolutely no scientific basis for the suggestion that there will be “disruptions to the food supply (Including the ocean food chain) and access to clean water” from a “warming planet” caused by AGW, with “a few tens of millions of starving people” as a result. Pure poppycock (to put it politely). The worst thing that could happen is a significant global cooling. This would reduce growing seasons and eliminate some of the arable land area in northern latitudes across Canada, Europe and China. Where are the impacts you mentioned defined, quantitative estimates provided and the net damage costs estimated (equivalent to the estimates of sea level rise I provided above)? Your arm waving is unhelpful. It reinforces the impression there are no reliable, objective, well justified estimates. Yeah. I have read that blurb about the Late Permian mass extinction event. I also saw/heard Richard Alley’s talk at a past AGU meeting on the “CO2 control knob”, where he mentions this. “We discuss features of the PETM that require explanation and argue that mechanisms that have previously been proposed either cannot explain all of these features or would require some sort of high-energy trigger. A bolide impact could provide such a trigger and, in the event of a comet impact, could contribute directly to the shape of the carbon isotope curve. We introduce a carbon cycle model that would explain the PETM by global warming following a bolide impact, leading to the oxidation of terrestrial organic carbon stores built up during the late Paleocene. But of course, as you know, there’s not enough CO2 in all the planet’s fossil fuels today to get anywhere near the levels surmised during this extinction from human emissions. And the “trigger” for the PETM is apparently still unknown. So the PETM, like the atmosphere of Venus or a lot of other really “scary” hobgoblins that are presented to frighten the unwitting public, have nothing to do with the reality of AGW. Physical evidence in the Australian hstory of sea rise. So, you he marks do not speak for themselves. To interpret the marks you have to read a book. Now, he’s made a claim in his book that the mark was placed at MSL. So, we are basically trusting something that cannot be independently checked. Unless you believe everything you read. Can you independently verify the temperature records for each day and in each location you use in the BEST record for the period back to 1820? It’s probably impossible to avoid significant biases even by best effort. Any serious research based on anecdotal data should include an extensive analysis of known and potential biases. The instrumental records have their problems but they are not comparable to the problems of anecdotal data. Sorry, just because they are figures don’t make them any less anecdotal than words. The instrumental record is riven with problems, not the least being that none of the individual records taken each day were verified by a second reading taken at the same time in the same circumstances. how does that differ to an anecdotal observation? Where’s Mosher when you need him with that “true” BESTest global Tmin?
. Funding for tonyb is zero. That for assessing the temperature record Is many billions. It is a shame more funding is not put towards assessing anecdotal data, there are many millions of pieces of information out there. I have no notion what you’re smoking, but it is apparently causing you problems to think logically. Physical evidence trumps model simulations every time. If you and Pekka can’t understand that, too bad. It’s like the carbon-dated remains of tree stumps that are found under receding alpine glaciers, high above today’s tree line. Model simulations? Who has been talking about them? What I have discussed is systematic well organized analysis of empirical data. If you are talking about “empirical data”, I have no quarrel with you. A man putting a mark in stone at MSL is only as good as the man making the mark. A group of people analyzing sea level data points from satellite altimetry, where the errors inherent in the methodology are greater than the absolute trend itself and all sorts of adjustments must be made to get anything out of the raw data, are in much worse shape than the guy making the mark in stone. In the above cases we are discussing “empirical data” (assuming that the “adjustments” made did not introduce a spurious signal, which would make the data “no longer empirical” but “hypothetically modified empirical”). But when we are talking about model simulations, we are no longer talking about “empirical data”. And there I say that the mark in stone or the carbon-dated tree stump from under the glacier trumps the model simulation every time, because these are empirical data while the model simulation is not. That was the point I was trying to get across. Model evidence is real (if you’ve got access to the code). huh. This is quite the opposite of my position. Sorry, Steven, you just stated your position. The “mark in stone” is empirical physical evidence. A model simulation based on theoretical inputs is not physical evidence. It is nothing more than a theoretical deliberation. Pekka’s idea that one single “mark in stone” is less valuable than a thousand model simulations is wrong IMO. The number of data points is less important than the inherent quality of the points. Theories are nice (and even an absolutely essential ingredient of the scientific method), but Feynman is pretty clear on this distinction – and, as a rational skeptic, I believe one should insist on empirical physical evidence to validate a theory. The mark on the stone is just that. It means nothing unless you believe the words in his text. In short, you have to believe that he wrote an accurate description. That he made an accurate assesment. And that he remembered accurately. Those beliefs cannot be tested. he wrote that the mark was made at MSL as best he could estimate. You believe that. That is an unfalsifiable belief. You cant test his recollection. Its a historical record, which cannot be repeated or tested. You see, “empirical” isnt as simple as you like to make it out to be. the mark is a mark. Was it made at high tide? low tide? or his estimate of MSL? You can’t know. you cant even test it. All you can do is choose to believe. I look forward to the day when we can purge our colleges of those who are polluting the minds of our young people with their dogma. When I was a college professor for 9 years, I used to teach my students how to think not what to think. In the liberal universities today thought, that no longer happens. Unfortunately the left controls the curricula at the elementary, middle and high school levels in science and other major topics and the brainwashing begins early. We live in the “Misinformation Age”. I gave a lecture on climate factors in a Boston area school in recent years and a student stood up and said he was mad….not at me but at his school. He said he played plenty for his tuition but in two courses supposedly covering climate, he had not heard anything about the factors like multidecadal ocean cycles and the various ways cycles on the sun affect climate only greenhouse gases. Wow, this sounds like something a Totalitarian Regime would say when trying to take over. “Purging” universities and colleges of the educated is one of the first things dictators do when coming to power. D’Aleo’s political viewpoints seem very far to the right..
Only fear of the trugh or hatred of meaningful communication could motivate someone to label the idea of not paying for something you don’t want a totalitarian idea. Provide something of value to society that people will voluntarily pay for with their own money. It is a system that works. Don’t be afraid to hire only those teachers who can teach students how to think for themselves. When the Left decided to defrock morality and comon decency they also defrocked the Golden Goose. It will take years to flush a society of worthless turds and their offspring through a dented-up political and economic system that has been so severely corrupted by lies, superstition and envy that hatred has become the only medium of exchange in the Left’s blame game cash for chaos and clunkers liberal Utopia. Wow Waggy. Exactly who is full of hate and vitriol? And how do you suppose to “flush” these people you disagree with? Tell us Waggy…c’mon, don’t be shy or deceitful. Maybe mark them with stars first just to identify them, eh? That sort of language makes me nervous as well but we must remember that people use words in different ways and they don’t always mean something as extreme as we think. Naw. This doesn’t sound at all “like something a Totalitarian Regime would say when trying to take over”. Wag and D’Aleo are not supporting a totalitarian “conspiracy” here, Gates. It sounds more like something a concerned individual might say when this individual is afraid that the academic process is being suborned by advocates for socio-political reasons. Paranoia is paranoia, the and the advocacy to “flush” “remove” “purge” those who are “polluting the minds” of our young people with their “dogma” have the ring of paranoia to them. So no, I don’t see a difference. Apparently you missed this comment last year. Government Climatists’ GCMs are constructed to propagate a political point of view. Climatists want you to believe the science of global warming is far too complicated for you to understand and they preach to you that you must fear the future for your own safety. Climatists tell you reality does not give you a true picture of the world and caution you against listening to your own common sense. Climatists believe you should fear everything that free men do of their own accord. Should you abandon your own dreams and desires too? Can you be trusted to exercise your individual liberty? Should the rest of us also fear whatever it is that you wish to do? Address your fears and grow. Fear of global warming paralyzes & freezes the productive. Skeptics are not afraid. I am afraid we fear too much–humanity outside Western academia does not fear non-problems and yet, as Michael Crichton said, “modern people live in abject fear.” Be not afraid: the truth will set you free. Indeed. But let’s “purge” the college and universities of educated people and fill their ranks who follow your party line, eh? Then people can live in ignorance and fear, eh? Get a job and hire anyone you want. Why should the rest of us be forced to pay for a UN-approved witchdoctors. That’s liberal fascism. It is entitlement narcissism and so great is the self-proclaimed right of all catastrophist-junkies of Western academia to believe whatever they choose to believe that they feel entitled to lie to the rest of us if it suits them. How could their offspring be any better? Well, there could tend to be fewer of them. But I guess that is kinda expecting them not to be hypocrites. The kids may not fart in perfect pitch but there’s still the smell. There is no need for concern about sea levels for those who have been following the research by myself and others from among the 150 members at Principia Scientific International. I’d like to draw your attention to an Appendix now added to my current paper and also this comment I made regarding measurements made by the Russians from the surface of Venus. ” This story is huge. America’s prestigious National Academy of Sciences (NAS) and related government bodies found no greenhouse effect in Earth’s atmosphere. Evidence shows the U.S. government held the smoking gun all along – a fresh examination of an overlooked science report proves America’s brightest and best had shown the White House that the greenhouse gas effect was not real and of no scientific significance since 1979 or earlier. Before and after 1979: the fall of communism coincides with the rise of global warmanism. It’s a conspiracy Waggy! You’ve found out now where all the former communists went to find jobs! Congrats! Now take some time off and definitely take your medications. Yes Doug, increasing the concentration CO2 and other GHG’s cause temperatures to rise, and they do so because of the LW absorption and re-emission properties of the gases themselves. If you or anyone else wishes to ask questions about my paper, or if you believe you have an alternative explanation for the Venus surface temperature, please post your question or response below this post as I wish to keep all discussion on the one thread. Have you answered the Deuterium question yet? If not, you have yet to find a clue about why Venus is so warm. Which involves the loss of hydrogen- either H2, H2O, methane, sulfuric acid, etc. I know that since Venus surface is extremely young, that it would unlikely one could find any evidence of a liquid ocean ever being on Venus. But is anything which points to there being a ocean of H2O on Venus? x ‘made’ the mark, x ‘wrote’ the documentation in his log book ..
kind of evidence that would hold up in a court room trial? The Skeptical Warmist “It’s a conspiracy Waggy! You’ve found out now where all the former communists went to find jobs! Congrats! Now take some time off and definitely take your medications”. Ah the fake skeptical SKS- Lewandowski” crazy making taunts – when all else fails resort to crazy making and taunts of conspiracies even if YOU invented the fantasy !! “Twentieth century global mean sea level rise: is the whole greater than the sum of the parts? Say, Web Hub Telescope, if’n – that’s – who – you -are? swans out there and we are frail, frail, frail. letters, WHT, it – jest – ain’t – fair – play. Did you see this upthread? I don’t know what you think, but after reading his subsequent comments surely Webby must have put himself right in line for the second equally prestigious award soon to be adjudged by the completely independent nomiations committee also responsible for the ‘bare faced cheek’ award. Perhaps you might think that-as suggested-the first award is worthy of one of your thoughts for the day? I am also curious as to what is happening to the sea floor. Is anyone measuring changes , if any, of the plates under the oceans? Any movement there would affect sea level surely, sometimes quickly but transitorily like tsunamis , but mostly gradually over time. Likewise what estimates are there for the effect of eroded solids being deposited in the world’s oceans? Upthread Fan suggested you might like to note climate change by taking part in a study of birds that has been undertaken for 40 years. Fan rarely likes to go further back than this as this disrupts his notion that climate change is purely a modern event. We can observe a steady if erratic rise in temperatures dating back some 350 years making Giss a staging post along the way but not a starting post. We have numerous much older studies of species migration. Thanks tonyb , I see this very often with the alarmist fanboys but the long view is the right view indeed. When you look at the geological record it’s impossible to get excited about the last 50-100 years. I do like the idea that seems to be creeping into the zeitgeist that something important is connected to the sun and we should all be making more effort to understand what it might be ( AR5?). WHT, YOU HAVE BEEN NOMINATED, fer this award. criticise others fer what you do yrself. paintings? Tsk, theyre OUT because they’re ANECDOTAL! Your 5.57 succinctly summarises it. If he had a sense of humour he would ruefully admit with a smile that he is doing precisely what you say and I’m sure something we all do at one time or another in some field of life. The Grapes of Wrath. A Narrative..
Possum exodus, trampin’ the highway, headin’ north. “Ma daddy tol’ me how his grand pappy followed this road. Possum (heading north on Highway 11 (to avoid motorway traffic) meets raccoon headed south: Where you goin’, man? Doncha know we’re s’posed to all be migratin’ north to git away from dat catastrophic global warmin’? Southbound Raccoon: Yeah, man. But all dem humin beens comin’ south to retire gonna make a bunch of yummy garbage – so dat’s where I’m headin’. When they start seeing these in Minnesota, let me know. Mann it is cold this morning! Possums round here sometimes have shells, not seen that before. Possums with shells are called armadilloes and I reckon they may be moving northwards as well. Not an anecdote but a prediction. If you spot an armadillo in the greater Chicago area, let me know. a nice “1984” twist to it. Didya’ at some stage, work fer the UN? That was a splendid definition by Max. Naw. I applied as a teenager, but never got the job. Can we nonimate each other? Isn’t that how it generally works anyway? And what do scientists who study and publish in this area think? Those at Proudman Institute think it has not accelerated (see Holgate 2007). QUestion: Since we can calculate within a factor of 50% or so the stable temperature of the earth just by looking at the concentration of green house gases on the earth and no other factors it does not make any sense to me to talk of feedbacks as having any impact other than transiently. The earth cannot heat to 900 degrees or something based on feedbacks or even twice the theoretical stable temperature without a much larger input of energy from somewhere external to all this. Therefore the question seems to me to be what is the time for these feedbacks to occur, what is their size and duration once they happen but ultimately the feedback must go back to 1, i.e. zero temperature anonoly from the steady state temperature calculated just by looking at the greenhouse gas concentrations. Which means the CS is really just 3.7W/m2 or about 1C / doubling of CO2. Sure there may be more for a period of time but it seems incredibly improbable to me the feedbacks are very high as the interia of the system must be enormous and the energy wasted in the exchange and short term movement must be enormous. I have never seen a natural system which doesn’t involve say explosives or releasing massive energy through chemical bonds being broken en masse how the system could generate twice the energy of the initial impulse. There may be local hot spots and such but it is hard to imagine how without invoking massive chemical reactions and changes that I don’t think are happening how we could be getting 2 or 3 or 4 feedbacks from the initial perturbation. That 1 C in ocean temperature gives the atmosphere 7% more water vapor, which increases the GHG effect to about 1.7 C which gives more water vapor increasing it further in a series that converges to near 3 C.
At a temperature of around 20C, the partial vapor pressure curve of water increases by between 5 and 6% so the number of 7% seems a little high. The heat of vaporization of water is 0.42 eV so a number of about 5.5% also makes sense with the differential form of the Boltzmann activation. The heat of sublimation is about 20% higher so perhaps the 7% is a combination of ice and liquid pressure increases. A reference might be handy to see the provenance of the 7% number. WHT, yes, it goes inversely with temperature squared. You could argue to use 288 K as a global mean surface temperature which gives about 6.5 percent, or colder temperatures still, reflecting atmospheric temperatures where the RH remains fixed. This number has some uncertainty for sure. I’d agree that there is a lot of “uncertainty” about a fixed relative humidity with warming. The long-term NOAA record of tropospheric humidity from radiosondes and satellites shows that water vapor content (specific humidity) has decreased with warming. Short-term observations by Minschwaner + Dessler (2004) showed that SH increased with warming, but only at less than one-fourth the amount required to maintain fixed relative humidity. So, yes, I’d agree with you that the physical observations do not support the IPCC assumption of fixed relative humidity with warming. The RH equalization is longer term. First I would expect the RH to decrease as the land warms faster, gets less cloudy and drier (more drought-like). The dry transient state that we started out on is nothing to look forwards to either. I have read a lot of posts on this topic, but I am unable to find quality content. Does anybody else also agree with me? Pingback: Slowing sea level rise | Climate Etc.